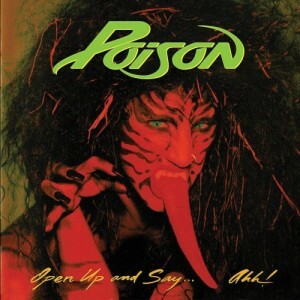 As a huge follow-up to their dynamic first multi-platinum album "Look What The Cat Dragged In" (Friday Music 86735), Poison returned with the mega hard rock metal classic "Open Up And Say Ahh! Produced by Tom Werman (Cheap Trick) this hard rockin’ event catapulted this band into even further fame thanks to the big number of hits singles and rock radio tracks that forever etched the name superstars to this band. Featuring such chart toppers as "Nothin’ But A Good Time", the Loggins and Messina classic "Your Mama Don’t Dance" and of course the #1 power ballad "Every Rose Has Its Thorn", "Open Up And Say Ahh!" was truly a milestone release for Poison. Friday Music is once again pleased to announce the continuing Poison 180 Gram Audiophile Vinyl series with their multi-platinum chart topping "Open Up And Say Ahh!" Mastered impeccably by Joe Reagoso (Poison/Alice Cooper/David Lee Roth) from the Capitol Records tapes at Friday Music Studios, this watershed classic truly shines and is a perfect audiophile vinyl addition to your hard rock listening. For this limited edition release, we have included a stunning first time gatefold cover, with the hard to find original art elements from this late eighties classic.